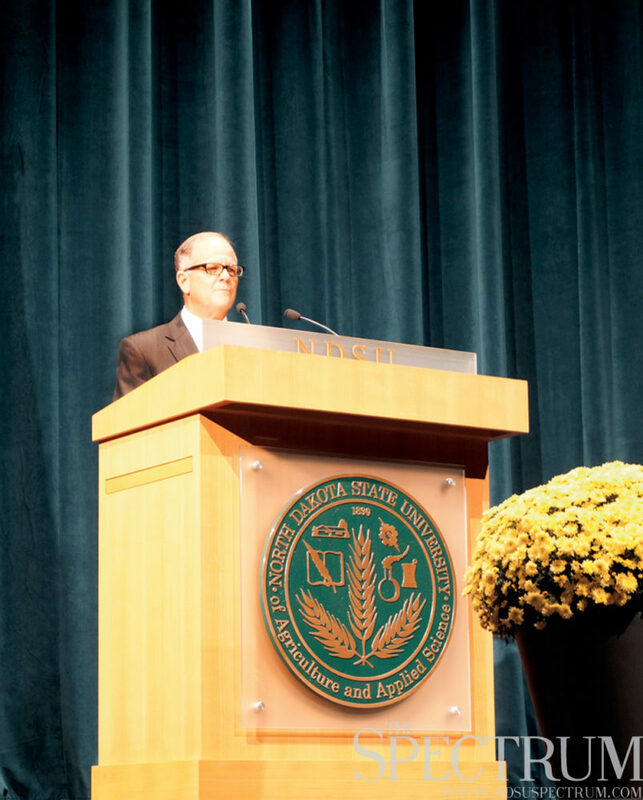 NDSU President Dean Bresciani thanked his audience for being “NDSU true” in his Oct. 8 state of the university address. North Dakota State does it best in the five-state area, at least according to President Dean Bresciani. In his State of the University address Thursday, Bresciani reviewed the past year and also talked about what lies ahead for NDSU. His address focused on the NDSU and Fargo communities and how everything is connected throughout the campus and students. Bresciani said there is a need for continued education, adding 97 percent of good jobs from 2010 to 2014 went to people with a bachelor’s degree while people with a high school diploma or less are losing their jobs. President Bresciani said he looks to the future of NDSU with new software, buildings, improvements and students. “Strategic plan is not just about achieving but leading,” he said. The graduate enrollment is at a record high along with doctorate program seeing a 4.5 percent increase from last year. With these programs seeing record highs, NDSU has been able to collaborate with Association of American Universities, even though the university is not a member of it, Bresciani said. NDSU is “on path to gain membership to AAU in the foreseeable future,” Bresciani said, but for that to happen, some targets need to be met. One of those targets is an enrollment of 18,000 students. Another aim is increasing the student scholarship endowment by at least 10,000. The new STEM building will have a profound effect on students and is a symbol for the teaching and learning at NDSU, Bresciani said. He also spoke about replacing Dunbar Hall, for the building has been closed due to water in its electrical system. Bresciani also said Sudro Hall could put the accreditation of the university’s pharmacy and nursing programs at risk. University Village may be seeing a change in the future with new housing complexes, he said. Bresciani said the university is “committed to solving complex problems,” and with the help of student, state and private investments and inputs, the problems are being solved. “I expect us to accomplish these goals in the next five years,” he said. Creditors will be here on campus in a few weeks, and Bresciani said he suggests that everyone attends the meetings that will be held. The creditors will be peer reviewing the entire institution from top to bottom to make sure the university’s mission is embodied throughout the entire campus, Bresciani said. The meetings will be held Oct. 19-20. Bresciani also plans to create a permanent recognition for Catherine Cater who worked with students for over 50 years and brought an unforgettable atmosphere to the campus. He finished his address with saying that it’s “time to see the rewards” for all the hard work that’s been put in to make NDSU the campus it is.